Ribosomes are the organelles responsible for protein synthesis in cells. LMU researchers have now dissected early steps in their assembly and visualized how their RNA components fold correctly and find their places in the growing structure. In actively growing cells, a huge variety of proteins must be synthesized in widely varying amounts. To meet these demands, the cell’s protein factories – the ribosomes – which are made up of proteins and several RNAs must themselves be built in considerable numbers. A growing yeast cell produces on the order of 100,000 ribosomes per hour, each of which consists around 80 ribosomal proteins and four ribosomal RNAs (rRNAs), distributed between two distinct subunits that functionally interact with each other. In addition, ribosomal assembly requires the intervention of approximately 200 other proteins that serve as biogenesis factors, which are not part of the final structure. These factors orchestrate the construction of the ribosome and direct the sequential folding of the rRNAs, which provides the appropriate binding sites for the insertion of the ribosomal proteins. LMU researchers led by Professor Roland Beckmann, in cooperation with Professor Ed Hurt’s group at Heidelberg University, have now determined, for the first time in three-dimensional detail, how the early steps in the assembly of the large subunit take place in yeast cells. The findings appear in the leading journal Cell. 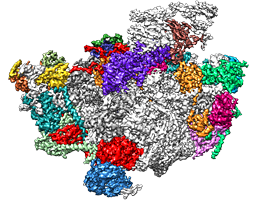 Ribosome assembly begins in a specialized region of the nucleus called the nucleolus, where three of the rRNAs are transcribed in the form of large precursor molecules. Each molecule is enzymatically processed to yield the mature segments found in the finished ribosome. Two of these, named 25S and 5.8S in yeast, are incorporated into the large subunit. Later steps in the assembly process occur in the nucleoplasm, before the still incomplete ribosome is exported via pores in the nuclear membrane for final maturation in the cytoplasm.“This multistage process reflects the extremely complex nature of the whole operation,” says Lukas Kater, the lead author of the study. In order to elucidate how the 25S rRNA is folded, the team purified five ribonucleoprotein complexes from the nucleolus, and determined their structures by means of cryo-electron microscopy. Each of these complexes is associated with different sets of biogenesis factors and represents a discrete stage in the assembly process. “This approach allowed us to identify the functions of several of the early biogenesis factors and determine the sequence of RNA folding and protein-binding steps involved in the early stages of assembly of the large ribosomal subunit in the nucleolus,” Kater says. It turns out that the 25S precursor RNA actually starts to fold up from both ends, and not in the sequence in which the folding domains are organized in the linear molecule. Domains I and II fold first, followed by domain VI at the other end of the molecule. Then III, IV and V follow, in that order. “This enables a sort of ‘exoskeleton’ to be generated for what will later become the catalytic center (where eachprotein’s amino-acid subunits are linked together in the correct sequence) and the exit tunnel, through which the growing protein chain emerges from the ribosome,” Beckmann explains. He and his colleagues now plan to investigate further intermediates in the assembly process to obtain a more detailed picture of the phase of ribosome construction that takes place in the nucleus.